The Rhode Island Department of Transportation hosted an autonomous vehicle technology demonstration on Feb. 20 along “low-volume” roads in and around Quonset Business Park in North Kingstown; part of what the agency calls its “Little Roady” pilot program, named after the “Little Roady” self-driving all-electric shuttle bus being tested. 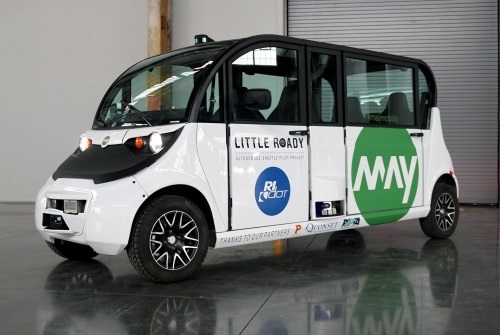 The Little Roady shuttles – capable of carrying five passengers along with an attendant who is trained to operate the vehicle manually, if needed – are provided by May Mobility, Inc., which entered into a public-private partnership with RIDOT in late 2018. RIDOT said in a statement its demonstration event will be followed by a “testing period” in Quonset and one in Providence prior to the start of fully autonomous shuttle service later this year; service that will deploy up to six self-driving shuttles operating on low-speed roads along a 5-mile, 12-stop route along the Woonasquatucket River corridor. The agency added that all of the vehicles and all their sensors will undergo a “rigorous acceptance protocol” encompassing 500 miles over which the vehicles must pass several safety tests including adhering to lanes, avoiding obstacles, and safe operations in both daytime and nighttime conditions as well as in different types of adverse weather. RIDOT Director Peter Alviti, Jr., said the demonstration event is the “latest step” in a multi-agency effort called the Rhode Island Transportation Innovation Partnership – which his agency launched in 2017 – that aims to examine autonomous mobility solutions, ridership, workforce impacts, environmental impacts, and technology adoption, among others. “We’re working on projects like the autonomous vehicle pilot project to make our transportation system better, and provide more mobility choices for our customer, the Rhode Island taxpayer,” he explained. “This project gives us the opportunity to gain first-hand experience with this new technology and that information will be invaluable when we look ahead to the impact that autonomous vehicles will have on public transportation in the future,” added Scott Avedisian, CEO of the Rhode Island Public Transit Authority. “Having some of our bus operators ride the shuttle routes is also going to allow them to share important feedback on the role of on-board personnel and passenger needs,” he said. “Every time we expand to a new city it allows us to learn something new. Partnering with RIDOT, we are more closely integrated with existing rail and other services than ever before,” noted May Mobility CEO Edwin Olson in a statement.